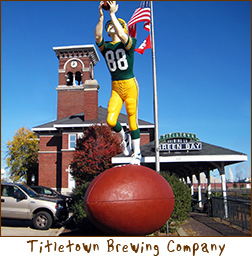 Titletown Brewing Green Bay opened on December 3, 1996. 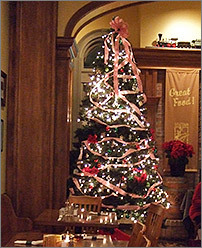 They serve the area as an upscale eating establishment and microbrewery, while preserving the 100 year history of this Green Bay landmark. In December 1999, the depot was officially named to the National Register of Historic Places. Very unique place and a great option for tourist and locals. It has a very friendly and upbeat atmosphere. Food: I had a burger and my wife an alfredo flatbread option, both were very good. Portion sizes were just right. Beer: As far as I know they only serve their own and all the ones we tried were very good. Prices: Food was average priced, nothing terrible. Beer is a little more than your general domestic obviously. If I frequented here I'd almost join their club, but drink prices can add up if you're there awhile. Service: Our bartenders were very friendly. The staff seemed very warm and upbeat. They all seemed to enjoy their job, even if they really don't. As said cool place, its an old depot obviously. And the outside area is great when its warm enough. Its a great option for our area. The only reason I could see one not loving it is it can be expensive if you like having multiple drinks. Is easy to locate, local historic site, Brad the owner took me on tour was very informative.the staff very friendly fun atmosphere, near museum, downtown area and for me was high lite of my trip to game Jan 2nd. Saturday the 1st. met AJ Hawk and made some good friends there also the beer is good and cold. Will be reg stop for me thank you Brad and crew. Coming here made me feel like a tourist in my own city! The history of this place is amazing! I enjoyed learning about the various past presidents who travelled through the railroad depot. We certainly enjoyed the train going by while enjoying our Friday perch and a bacon cheeseburger! Service was superb! I could see this place very crowded during peak hours, but my wife and I came during odd times. I'd suggest this place for families with children, as the children at the other tables were happy and entertained. I didn’t really go over by the bar at all but it looked pretty busy! Titletown Brewery is a fantastic spot to take anyone! Food wise everything was great, but I’ll be honest you come for the history and atmosphere! I Highly recommend Titletown Brewery for a fun lunch, a business lunch, or dinner out with friends. This place has beer that will make you wonder why you should ever buy a six pack again in your life. Their food is excellent. The beer cheese soup is outstanding. The cucumber salad as a side is a great option. Customer sevice is outstanding. The owner sometimes greets you and remembers who you are and is genuinely interested in how you are doing and who you are with. I am somewhat embarrassed that it has taken me this long to write about an establishment in Green Bay that has been around, well let's just say, for quite some time. While it hasn't been a food and drink kinda place all that time, it still has been a part of the growth and development of this town. I'm referring to Titletown Brewery Co. Back in it's heyday it was the Chicago and Northwestern Railway, a major hubbub for it's time. And while the Railway chapter has long ended, the essence is not gone. It's just transformed into an upscale casual eating restaurant and microbrewery. Titletown was introduced in the year of 1996 and has been going strong since, all the while still keeping its rich history alive. I know, I know, what's a Bud Light girl doing in a Microbrewery place like this? I would have to hold off on my piss water beer and join a group of friends to try out new beers. It's not easy being me. It was a Tuesday evening around 7PM and the front cement lot was full, so we drove around to the back gravel one and that was full too. We parked waaaayyy down in the back. I thought it can't possibly be this crowded on a Tuesday night, can it? As we entered the front doors we were greeted with heat, loudness and smiles. This place was beyond crowded. Tuesday nights are now the hot nights to go out – at least here at Titletown. The place itself is huge. You have the bar area, the main floor restaurant area and an upstairs area too. The upstairs had some holiday parties going on, hence the million cars out back. I didn't see them but I know they have rooms available to rent out for parties or business luncheons. Just give Titletown a call if you're interested in the details. We made our way to the bar section. The bar was full but we found an empty table still in the bar area. I don't have to tell you what people were drinking. This is a microbrewery, so your first guess is probably correct. Oh, and some wine. There were quite a few ladies there and they were having a good ol' time downing glass of Chardonnay after glass of Chardonnay. As for what kinds of beers they brew there were a lot. Like, a lot. So if you like beers, and good ones at that, come here. Some of them were: Railyard Ale, Deja Brew, Dark Helmet Schwartzbier, Claymore Scottish Ale, Hopasaurus Rex (LOVE that name), Johnny "Blood" Red, '400' Honey Ale, Bridge Out Stout, Brown County Porter, Brunswick Brew and a few others that I know I missed. I liked the Deja Brew and the Johnny "Blood" Red. And I've come to realize, that I'm not a Porter type of girl. They just taste like a coffee blend to me and I know that beer enthusiasts who are reading this are slapping their foreheads and saying "NO no no no noooo," right now. I apologize. If you're not into the wine or the many, many microbrews they do offer a full liquor bar too. And for all you DD's this season, try out their Sno-Cap Root Beer, it's made there too and is fabulous. Now, that's some good s***! 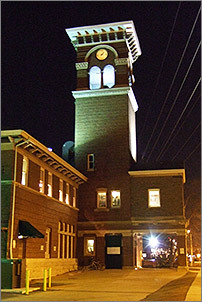 Titletown Brewing Company is a restaurant and microbrewery located in a renovated historic railroad depot. It is a unique establishment and has a rich history that is displayed throughout the building. The atmosphere is lively and fun. It was festively decorated for the occasion with ghouls, pumpkins, and spider webs in honor of Halloween. Their menu, in an inventive and unique way, has the layout of and is printed as a newspaper. 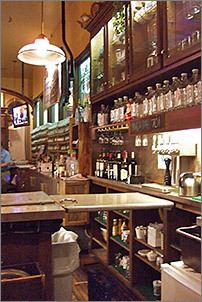 Featured on their menu are fresh brewed beers with flavor descriptions and the ingredients they use for each one. I also appreciated their suggested dressings to accompany each of their salad entrees. Our server was very helpful and well informed about all the items and ingredients on the menu. I was in the mood for a hearty sandwich so I ordered the Pastrami Melt for $8.99 with a choice of pub fries, cucumber salad, mashed potatoes with gravy, sweet potato fries, or pasta salad, I went with the cucumber salad. My husband decided on their Gourmet Burger of the month; this particular month was the Tail Gate Burger for $9.99 and he went with the pub fries. For a beverage he ordered their award winning Rail Yard Ale for $4.50. My sandwich consisted of shaved pastrami, smoked Gouda cheese, and crispy onion on grilled sour dough with spicy German beer mustard, lettuce, tomato, and onion. 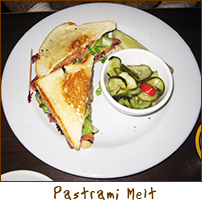 The sandwich tasted great; the pastrami was of good quality and the smoked Gouda made for a nice combination. My cucumber salad was fresh, thinly sliced cucumbers, sliced raw red pepper, sliced raw onion mixed in a sweet and sour vinaigrette served in a cup. The salad had an appealing taste and marked freshness to it. My husband’s burger was a 4oz brat patty with Swiss cheese on top and a 4oz beef patty with cheddar cheese on top, placed on a jalapeno cheddar cheese bun with spicy mayo, lettuce and tomato. It was delicious and gooey, the pub fries were thickly cut and well seasoned with salt and black pepper. They also were delicious. 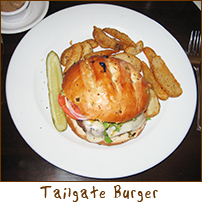 The beer was served in a large glass and was nice and cold with a malty flavor, just right with the burger. 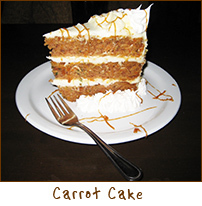 For desert we tried their carrot cake for $5.00. It had three layers with cream cheese frosting accented with whipped cream and drizzled with caramel sauce. The slice was huge and more than enough for two people to share. The spices in the cake were not overpowering, as they sometimes are, it was mouthwateringly good.